Cameron Boyce starred as Melbourne Renegades moved up to second on the Big Bash League ladder with a 27-run win over Sydney Thunder. All-rounder Boyce came to his team's aid at Marvel Stadium with an unbeaten half century. The Renegades were 77-6 when he came to the crease in the 14th over, but he was able to get them to a defendable total. He hit five sixes and four fours in his 51 from 22 balls, with a brutal display of power hitting, making 32 off his last eight balls. Boyce helped the home side reach 140-7 after they had won the bat flip, then produced the goods again with his spin bowling. The Thunder lost key wickets early and could only manage 113, before being bowled out with five balls to go. Boyce bowled superbly to take 2-17 from 3.1 overs, claiming the final wicket when he had Fawad Ahmed stumped. Star paceman Kane Richardson continued his strong form against the Thunder, with the crucial wickets of openers Shane Watson for four and Jason Sangha for two in his first spell. Though the visitors got back into the game late on, when Baxter Holt made 37 off 28 balls, Richardson came back to have him caught on the boundary with the fourth ball of his last over. Richardson, who now has a season-high 22 wickets in 13 games this season, ended with 3-27 from his four overs at a run rate of 6.75 runs per over. The Thunder had had the home side in big trouble until Boyce's rescue act, with Ahmed taking 2-22 from his four overs at a run rate of just 5.50 an over. After taking a simple caught and bowled to dismiss Tom Cooper he removed danger man Mohammad Nabi for 36. 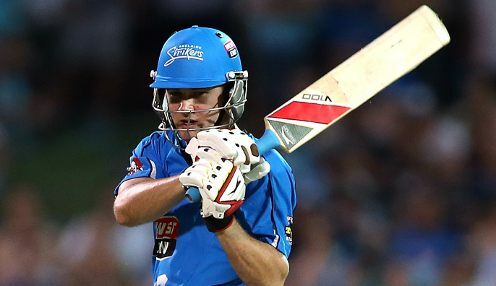 Melbourne Renegades are 1/1 to win the Big Bash League title. Sydney Thunder are 6/5 to win their next game against Sydney Sixers, who are 8/11.